This is one of those movies I saw about a billion times in my youth, but which I'm reluctant to revisit, for fear of discovering (A) that it might not be that good and (B) all the ways in which I quote it without realizing it. I just watched it for the first ever time! Pretty funny! It's secretly a sequel to Goodfellas. This movie featured prominently in my childhood. I hold it in regard that I suspect is significantly higher than its objective merits, and have not dared revisit it as an adult. I remember it as a bracingly absurd fish-out-of-water / odd-couple story that I once thought hilarious. The stunt casting of Martin as the lead, his makeup and the line readings and incredible smug charm were, I think, one of my first exposures to irony as a kind of humor distinct from and much more subtle than sarcasm. It shouldn't work. Maybe it doesn't work. I remember going along with it anyway. Also, as we are slowly watching our way through S.2 of Kimmy Schmidt, I'm a little bit annoyed in retrospect at how underused Carol Kane was in My Blue Heaven. 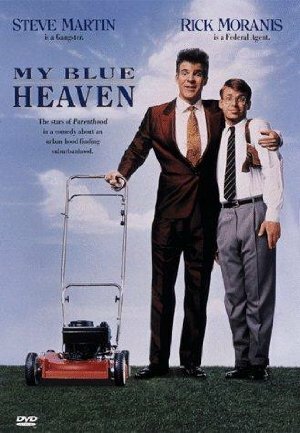 This was the first movie in which my mother liked Steve Martin. She never appreciated him until this movie. She still thinks it's hilarious so if you're worried about it holding up, it has for her. "Yeah, you have to have probable cause. Thomas Jefferson put that in the Constitution." "He didn't put in there for you!" "No, you're wrong, I'm exactly the guy he put it in there for. I am the worst case scenario of Thomas Jefferson's dreams." And it's true: in terms of trying to imagine in advance who might come along in the future, attempting to exploit your new system of Constitutional rights, a basically well-meaning and community-minded mobster probably is is the best-possible worst-possible outcome. I got to talk with Henry Hill quite a bit when the publisher I was working for at the time was doing his book. He was much more entertaining in person than in print, one of those endlessly entertaining always-on mile-a-minute talkers. Which would get tiresome after a while. We were always happy to see him, and always happy to see him go. You couldn't believe half of what he said, but he told a fine tale. I wish Moranis would start acting again. Isn't he just waiting for Hollywood to die in a fire? This is one of those movies in Steve Martin's too-short golden period where he was still creative, but not yet maudlin. For some reason, LA Story is the only one of these I saw, so count me in for a watch if I can find a source for this one. I always loved the "My new friend (blank) has his/her problems too" stuff in this. I am unable to operate a lawn mower without saying, "What a day for a mow, huh?" When Obama was running in '08 and some of the press were trying to make a big deal out of him talking about arugula in Iowa (totally bogus, of course, since it was a locally-grown crop), I kept thinking of, "Arugula. It's a vegetable." I remember seeing an interview with Martin where he said that he and Moranis were originally cast in each other's roles. Me too - though my memory is that they had approached Martin first to offer him the FBI agent role, and he said he'd only do it if he could play the mobster, since it would be more fun/something different. I don't think they cast Moranis until after Martin was attached, I assume getting Martin onboard was what got the movie green-lit for them to start casting the rest of the parts. But the casting was perfect. Martin & Moranis, of course, but I thought Moranis & Joan Cusack were cute together too, and all of the bit parts like William Hickey as the pet shop owner/former mobster. And I never get tired of those dance numbers. We still say, "Arugula. It's a ve-ge-ta-ble," every time we have arugula (which is pretty often). Some things just stick with you. I can't walk past the frozen foods section without thinking "you could melt all this stuff."